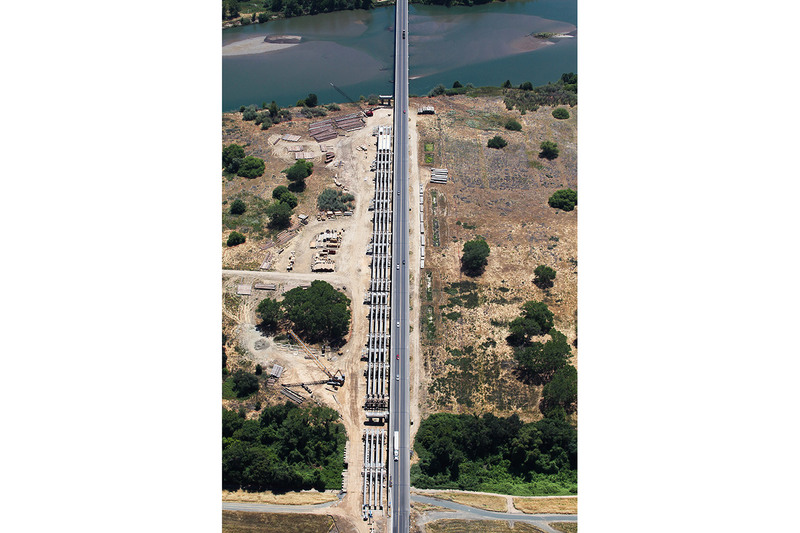 Spliced precast prestressed concrete girder construction has been used to construct the new 16 span, 3,148 foot long bridge structure for the Highway 99 crossing of the Feather River, about 25 miles north of Sacramento, CA. The new bridge is constructed along the east side of the existing structure and will carry two lanes for northbound traffic. The existing structure, having previously serviced traffic in both directions, will be used solely for southbound traffic. 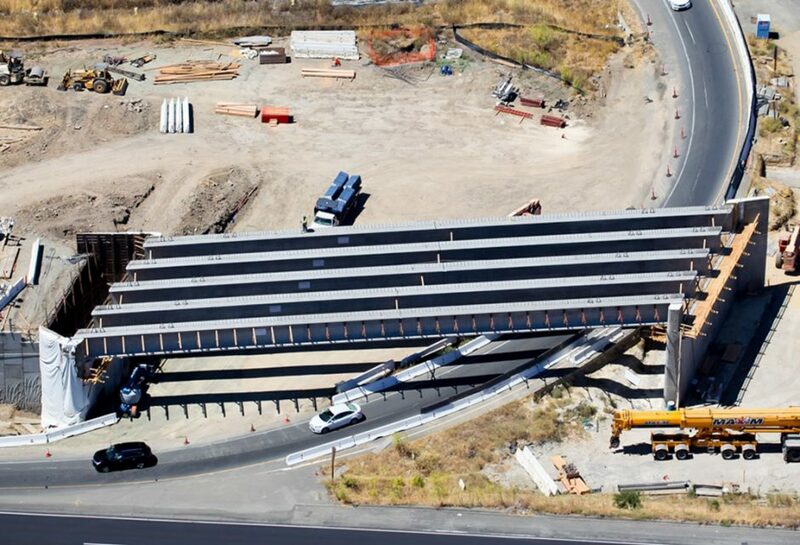 This $56.2 million dollar project, improving traffic operations and safety, completes the final four-lane highway link between Sacramento and Yuba City, CA. By widening the highway, the region will be able to meet growing traffic demands in the future and lessen congestion during peak travel hours. 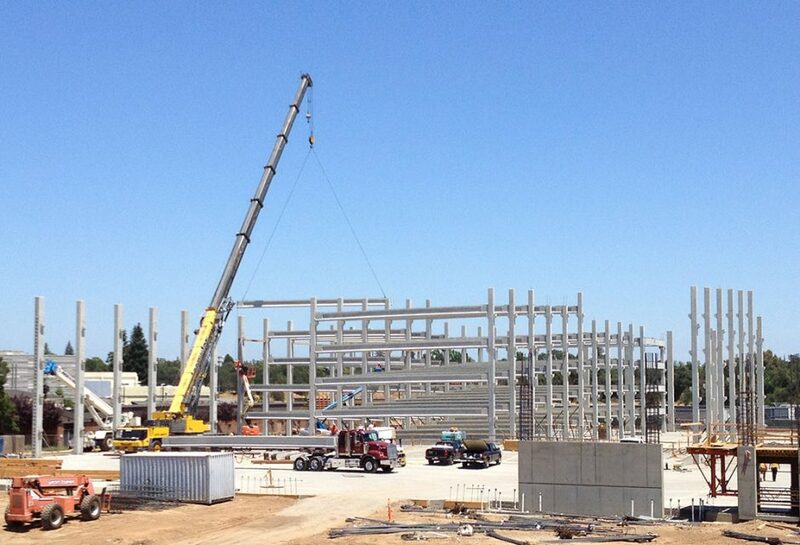 Con-Fab California Corporation fabricated and installed 132 girder segments ranging from 49 to 111 feet in length. The segments were installed in two mobilizations that occurred during the spring and summer of 2013. 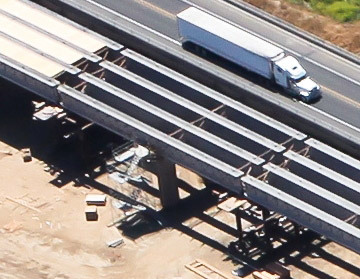 The unique precast section utilized by the Caltrans designers is an 8’-6” deep bulb tee and is a modification of the standard California bulb tee section. 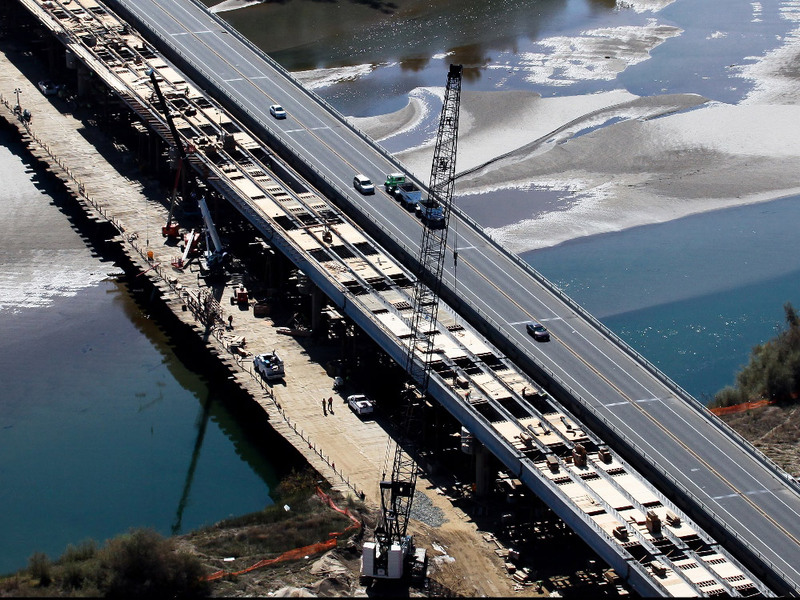 Thirteen of the structure’s eighteen spans measure 210 feet which is among the longest precast girder spans ever constructed in California. In addition to the pretensioned strands reinforcing each segment, multi-strand post-tensioning is used with two-stage stressing to provide continuity within each of the structure’s four frames. The use of precast concrete girder construction helped mitigate several important site constraints. The bridges’ location, completely within the drainage limits of the Feather River, limited construction access to the site to about six months of the year. 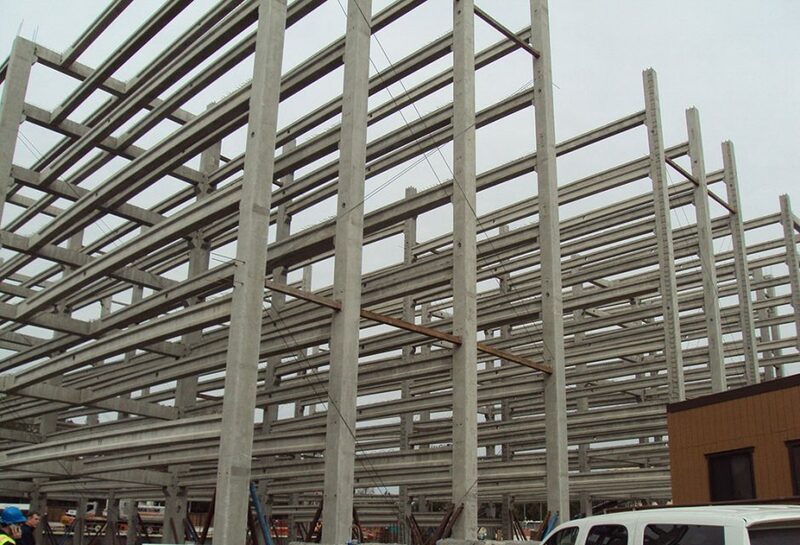 Precast concrete construction permitted a significant amount of work to be performed off-site and concurrent with on-site activities resulting in an accelerated schedule for completion. The use of precast concrete also offered a significant reduction of construction activity impact on the site which is an environmentally sensitive area that is critical to the health of numerous wildlife species in the region. Prime Contractor: MCM Construction Inc.
Special features, Notable design, Record erection time, Modifications etc. 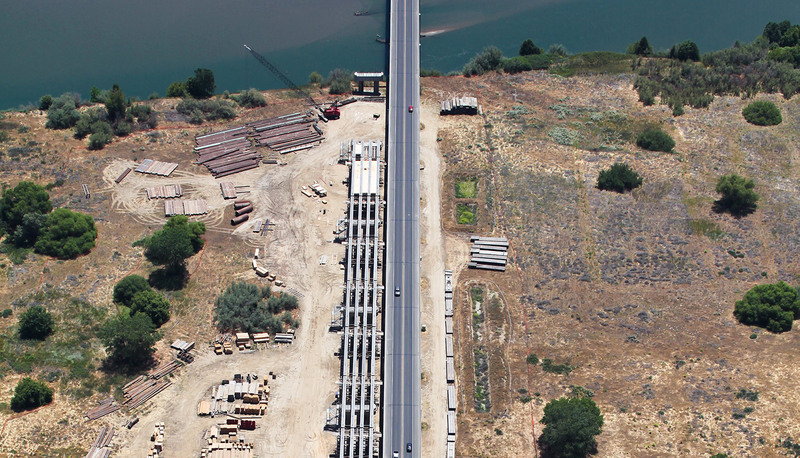 THE FEATHER RIVER BRIDGE WAS CONSTRUCTED TO PROVIDE A SEPARATE BRIDGE OVER THE FEATHER RIVER FOR NORTHBOUND HIGHWAY 99 NEAR YUBA CITY. THE ORIGINAL CONTRACTOR WAS NOT ABLE TO COMPLETE THE PROJECT SO MCM CONSTRUCTION TOOK OVER THE PROJECT IN EARLY 2013. ON AN EXTREMELY ACCELERATED SCHEDULE MCM WAS ABLE TO CONSTRUCT THE MAIN STRUCTURAL PORTION OF THE BRIDGE IN ONE SEASON. GIRDER ERECTION WAS DONE AT NIGHT WITH THE TRUCKS DELIVERING THE GIRDERS BEING OFFLOADED AT NIGHT FROM THE EXISTING BRIDGE WHILE MAINTAINING TRAFFIC. 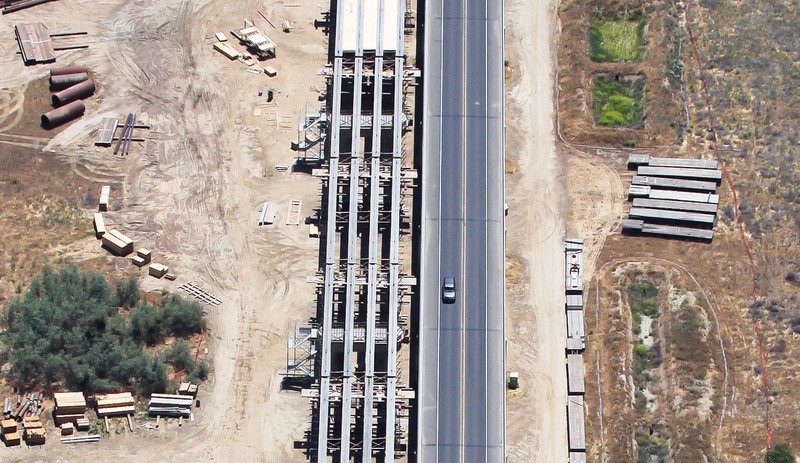 FRAMES 2 AND 3 OVER THE FEATHER RIVER HAD TO BE ERECTED WITH THE CRANES ON A TEMPORARY TRESTLE BRIDGE.